Ribollita is a well-known Tuscan soup, entwined with the history of Italian peasants of the Middle Ages. Literally ‘reboiled’, original ribollita recipes would have consisted of a reheated minestrone, imbued with stale bread for sustenance and bulk. What you’re looking at is frugal Italian cuisine at its origins. 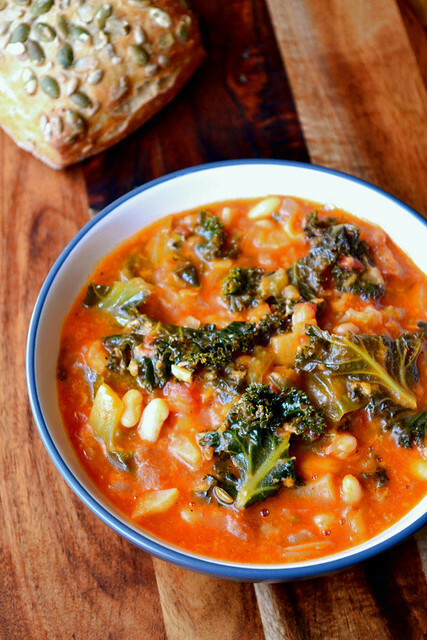 Like minestrone, there are so many different vegetables you can add to ribollita. Whatever you have in the pantry is fair gain. But absolutely all renditions should contain leftover bread, cannellini beans, onion and carrot. 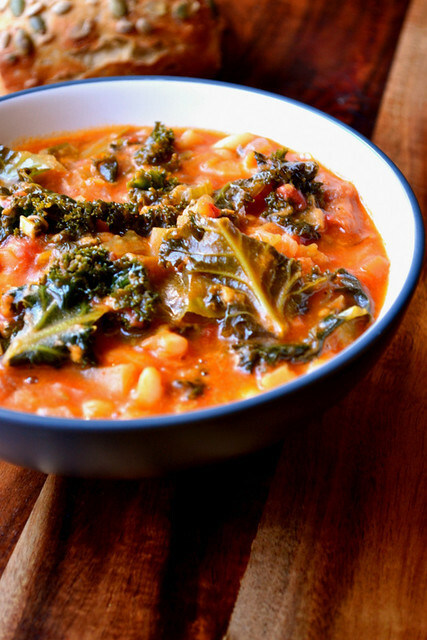 If you’re going to add greens to your ribollita – and you should – then Tuscan cavolo nero is the best decision. But it can be difficult to find. Happily, kale is a more than adequate substitute for cavolo nero, sharing many of its qualities; sweetness and hardy texture. Don’t be put off by the quantity of fresh greens going in the pot; they reduce considerably in volume. 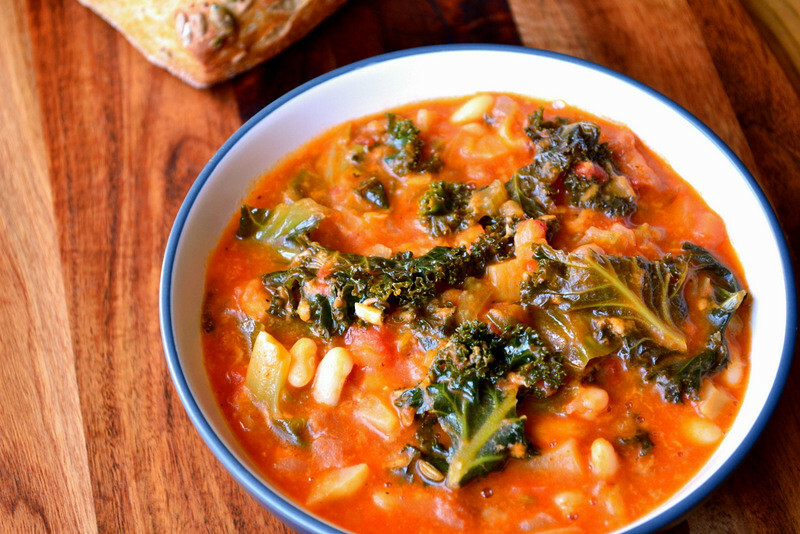 Despite having likened ribollita to minestrone, they shouldn’t be very much alike. Minestrone is brothy and contains pasta. Ribollita, generally speaking, doesn’t contain pasta and should be thick, substantial and almost glossy with good quality olive oil. Hearty doesn’t do this Tuscan favourite justice. If making your ribollita for two, double up. Though delicious freshly made, your taste buds will sing songs about your culinary achievements for years to come should you allow the flavours to develop and improve overnight. Ribollita is very much nicer the next day. A frugal lunch, perhaps? Sweat the onion, carrots, celery, artichokes, garlic, bay leaves and fennel seeds in 1 tbsp olive oil. Cook until soft through. Add the chilli powder, chopped tomatoes and beans to the pot and simmer for 10 minutes. Season with plenty of salt and black pepper and stir through the remaining 3 tbsp of olive oil. Serve immediately or the next day. 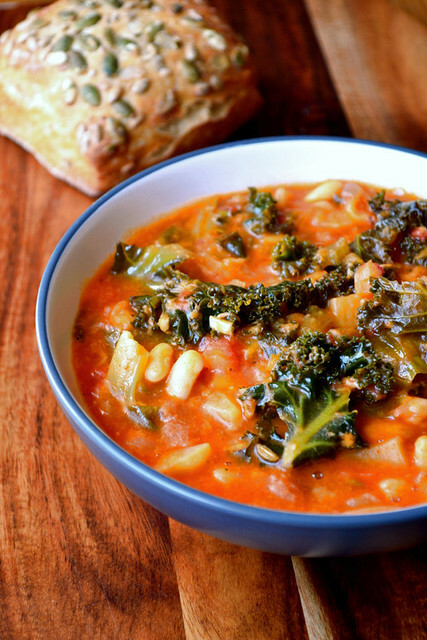 Cost: A great use of leftover bread, food doesn’t get a lot more economical than ribollita. You can make a big pot, plenty for four, for as little as £2.10. Peasant indeed! Thank you – it was so delicious. I’ll definitely be making it again soon. The kale does it for me! 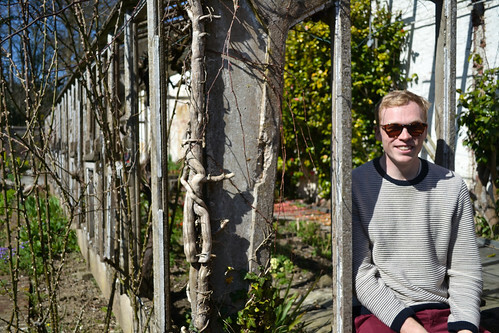 Thanks – they were lying about in my cupboard so I thought I’d better use them up! I love this dish and in Spain we have “cocimiento” which sort of traslates as “boil up” and it’s very similar! ahha – I’ll have to look that one up. Perhaps you can expect a recipe! I like the look of this but it includes Jerusalem artichokes which are right out of season in the UK and dreadfully expensive when they are in season – easy to grow but not many people do. Feel free to leave out the artichokes; they’re in there because I was given loads in a veg box. They must still be available, because mine were grown just up the road from where I live. When they are in season, however, I’ve not found them to be particularly expensive. My green grocer sells British artichokes for very little money. Beautiful dish and one of my favourites! Yours look scrumptious! Thank you so much – definitely now one of my favourites too. That’s great to hear – I hope you enjoy it. That’s great to hear – so happy you enjoyed it so much. Nick, this soup doesn’t have anything in it I don’t like. Besides being–I’m sure–delicious, it is so beautiful! Pinning! This looks great! Must try! Thank you! Please do, it’s delicious.